Guided Snorkel Tours with a Professional Guide and Photographer! 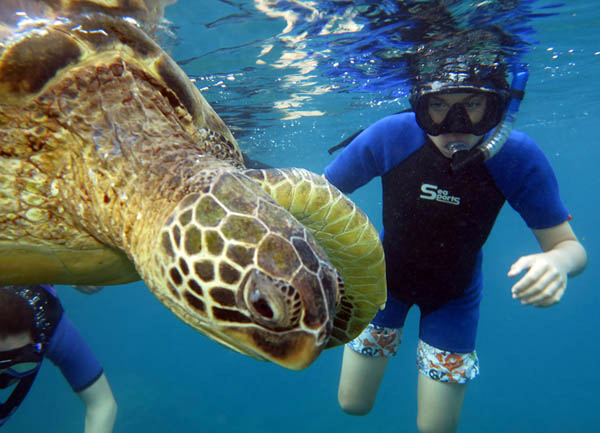 CHILDREN MAKE GREAT SNORKELERS AND LOVE TO VISIT THE SEA LIFE! LET ME TEACH AND LEAD YOUR FAMILY FOR A FUN-FILLED AND SAFE ADVENTURE! I will be your Private Guide, there to provide the best equipment, instruction, animal interaction, photos, safety, and most importantly, BOTTOM TIME! CHILDREN, BEGINNERS, AND ADVANCED SNORKELERS AND FREEDIVERS WELCOME! Enjoy the Solitude of a Private Snorkel Tour or Lesson. No Crowds or Rushed Preparation. Just Yourself or Share with Your Family or Friends. Dive at your own Pace. Maximize your Bottom Time. Choose a Private Tour Customized to Your Skill Level and Preferences using Top-Quality Equipment, and Guided by an Experienced Professional with over 32 Years of SCUBA Diving, San Diego Beach Lifeguard, and US Navy Rescue Swimmer Training and Service. Open Group Tours are available, Dive with other New and Repeat Clients in Small Groups of 6 or 8. Safely Explore the Underwater World, Let Adventure Inspire You, and Escape with Me to the “Big Blue”! Private Rates include all Equipment, Instruction, Guide Services, Sea-Print Photo Package, and Preferred Reservations. Open Group Rates include all Equipment, Instruction, Guide Services, and Reservation by Availability. Kids, Beginners, and Advanced Snorkelers, Ages 5 and Older. The First Pool SCUBA Experience. Ages 8 and Older. A Refresher Training for Certified Divers, Ages 10 and Older.